Discover the easy and effective way to learn Chinese characters! makes Chinese easy for you! There are more than 106,000 different Chinese Characters but only like a maximum of 5,000 are in use in China. A regular Chinese student learns about 3,000 of them in 10 years of school and can read 99,99% of modern Chinese texts. 1,000 Characters allow you to read 90% and only 300 Characters already enable you to comprehend about 75% of a Chinese newspaper text. Roughly about 106 Characters are of pictographic origin and can be illustrated with some creative power (like 火 "huǒ" which means fire or 山 "shān" which is the mountain). Another 30 Characters are indicative which also can be illustrated (like 上 "shang" which means above or 下 "xià" which means below). Then about 390 Chinese Characters are build combining 2 or more of the already illustratable signs building new combined meanings (of which some need creative explanations like 虾 "xiā" wich is combined of 虫 "chóng" which is worm or insect and 下 "xià" which we already know means 'below'. Combined it is an insect-like creature fisherman harvest from deep below the surface of the sea). This makes a total of roughly 540 Chinese Characters (>70% of literacy) that we could explain through the power of creativity and illustration. 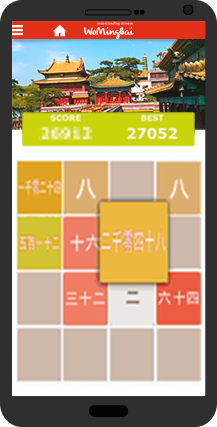 You probably know the coolest mathematics game in 2014 called 2048, right?! Do you use it as often as we do? Well, NOW you can start playing it with Chinese numbers. 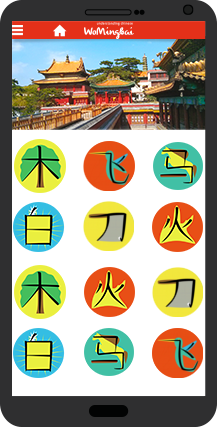 Don't miss any news on new Illustrated Chinese Characters, new free Chinese Learning ressources, new apps or other products. Just sign up for our mailing list - Don't be afraid, we won't flood you with emails. Which Chinese phrases do you really need for getting along on your next China vacation? Find the 33 Chinese phrases you can't live without and make your trip to something special. This free PDF booklet will introduce these words and sentences to you in Chinese (Chinese Characters and Pinyin) and English.